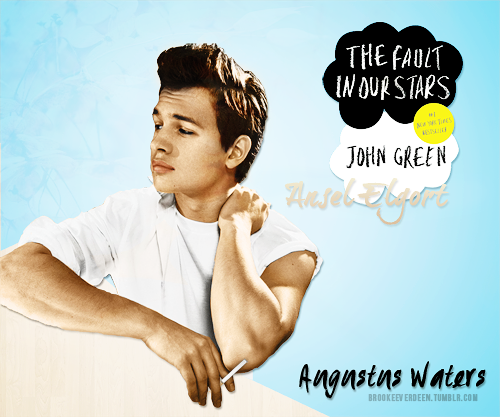 this week's cheer me up monday is going to mainly be about one of my current obsessions: the fault in our stars. i'm sorry in advance for my fan girling. 1. lectures were over last week! hooray! and twenty days from today, i will officially be on holiday! there IS a light at the end of the tunnel! 2. i live for the acoustic versions of songs! one direction released a piano version of their latest hit "you and i" and i love love love it. 3. it was donut day on friday, and stephanie from i am a food blog made waffled donuts!!! dying. waffles + donuts = heaven. 4. i have become so invested into zoe and alfie's lives it's probably unhealthy. they play the sims together and who ever thought watching other people play sims would be fun?!?!?! well, me and like a hundred thousand other people. 5. now getting to the main point of this post, i saw the fault in our stars yesterday night and i cried at exactly the same point i did in the book! haha the movie actually follows the book quite well (since when does that ever happen though) and i was so so happy with the movie! the quotes were all there, ansel elgort surprisingly did an amazing job at playing gus, and there were so many other people in the cinema who got so involved with the movie they were sobbing (quite loudly). i love the story so much and i 100% recommend this movie!!! 6. following on from the last point, can i just broadcast my love for jamie mcdell's song that she wrote through her inspiration from the fault in our stars book?!?!?!?!?! the best thing is that jamie is actually a singer-songwriter from new zealand! and from my hometown!!! so much love for her and her crazy talent. anyway this song, i actually found it a few weeks before watching the movie, and it made me want to watch the movie so much more! it has been on repeat the entire night. everything about it is so perfect: the lyrics, the video, jamie... it's called "it's time" and you can listen to her song here. 7. john green the author of the fault in our stars vlogs and talks about loving the movie as well! he also shows up in this teens react to tfios video and the girl that fan girls when john green shows up = me. 8. what i do every time i watch something crazy (i.e. the red wedding, the himym finale and in this case the fault in our stars) i tumblr search it. there are so many reactions (the red wedding one was the best though) and i could be entertained for hours! the best thing is knowing that millions of other people feel the same way you do! you should all do this after watching it though because spoilers!!!! 9. i already had one written in my list book but i'm starting to compile my bucket list online! since this is an adventure blog as well, i thought it would be relevant to share my to do list with you all and be able to tick them off together. i'd love to hear all the cool things on your bucket lists too!!!! 10. wouldn't be a post written by me if it didn't have a cute animal .gif in it. this is my all time favourite animal gif!